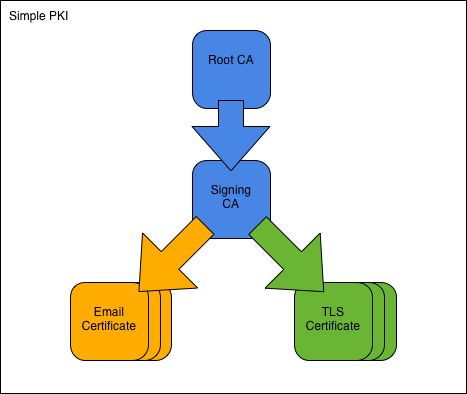 The Simple PKI consists of one root CA and one signing CA. We assume an organisation named Simple Inc, controlling the domain simple.org. The organisation runs a small PKI to secure its email and intranet traffic. To construct the PKI, we first create the Simple Root CA and its CA certificate. We then use the root CA to create the Simple Signing CA. Once the CAs are in place, we issue an email-protection certificate to employee Fred Flintstone and a TLS-server certificate to the webserver at www.simple.org. Finally, we look at the output formats the CA needs to support and show how to view the contents of files we have created. All commands are ready to be copy/pasted into a terminal session. When you have reached the end of this page, you will have performed all operations you are likely to encounter in a PKI. Please familiarize yourself with the configuration files before you continue. The ca directory holds CA resources, the crl directory holds CRLs, and the certs directory holds user certificates. The database files must exist before the openssl ca command can be used. The file contents are described in Appendix B: CA Database. With the openssl req -new command we create a private key and a certificate signing request (CSR) for the root CA. You will be asked for a passphrase to protect the private key. The openssl req command takes its configuration from the [req] section of the configuration file. With the openssl ca command we issue a root CA certificate based on the CSR. The root certificate is self-signed and serves as the starting point for all trust relationships in the PKI. The openssl ca command takes its configuration from the [ca] section of the configuration file. The ca directory holds CA resources, the crl directory holds CRLs, and the certs directory holds user certificates. We will use this layout for all CAs in this tutorial. The contents of these files are described in Appendix B: CA Database. With the openssl req -new command we create a private key and a CSR for the signing CA. You will be asked for a passphrase to protect the private key. The openssl req command takes its configuration from the [req] section of the configuration file. With the openssl ca command we issue a certificate based on the CSR. The command takes its configuration from the [ca] section of the configuration file. Note that it is the root CA that issues the signing CA certificate! Note also that we attach a different set of extensions. With the openssl req -new command we create the private key and CSR for an email-protection certificate. We use a request configuration file specifically prepared for the task. When prompted enter these DN components: DC=org, DC=simple, O=Simple Inc, CN=Fred Flintstone, emailAddress=fred@simple.org. Leave other fields empty. Next we create the private key and CSR for a TLS-server certificate using another request configuration file. When prompted enter these DN components: DC=org, DC=simple, O=Simple Inc, CN=www.simple.org. Note that the subjectAltName must be specified as environment variable. Note also that server keys typically have no passphrase. We use the signing CA to issue the server certificate. The certificate type is defined by the extensions we attach. A copy of the certificate is saved in the certificate archive under the name ca/signing-ca/02.pem. Certain events, like certificate replacement or loss of private key, require a certificate to be revoked before its scheduled expiration date. The openssl ca -revoke command marks a certificate as revoked in the CA database. It will from then on be included in CRLs issued by the CA. The above command revokes the certificate with serial number 01 (hex). The openssl ca -gencrl command creates a certificate revocation list (CRL). The CRL contains all revoked, not-yet-expired certificates from the CA database. A new CRL must be issued at regular intervals. All published certificates must be in DER format [RFC 2585#section-3]. Also see Appendix A: MIME Types. All published CRLs must be in DER format [RFC 2585#section-3]. Also see Appendix A: MIME Types. PKCS#7 is used to bundle two or more certificates. The format would also allow for CRLs but they are not used in practice. PKCS#12 is used to bundle a certificate and its private key. Additional certificates may be added, typically the certificates comprising the chain up to the Root CA. The openssl req command can be used to display the contents of CSR files. The -noout and -text options select a human-readable output format. The openssl x509 command can be used to display the contents of certificate files. The -noout and -text options have the same purpose as before. The openssl crl command can be used to view the contents of CRL files. Note that we specify -inform der because we have already converted the CRL in step 4.2. The openssl pkcs7 command can be used to display the contents of PKCS#7 bundles. The openssl pkcs12 command can be used to display the contents of PKCS#12 bundles. © Copyright 2012-2014, Stefan H. Holek, @stefanholek. Last updated on Oct 23, 2017. Created using Sphinx 1.5.3.